PENTICTON SOD SUPPLIER, Buy Online, Delivery Weekly. Turf Rolls in Osoyoos, Oliver, Kaleden, Summerland, Hedley, Keremeos. Sod Delivery - Specific turf grass variety grown for the Okanagan. We are a sod farm supplier servicing the Penticton area weekly. Get a quote and order now for your sodding project. Residential Lawns/ Strata Projects/ Commercial Developments/ Sport Fields Applications/ Golf Courses Fairways, Tee Boxes, Surrounds and Greens/ Municipal Sodding projects. We offer a Kentucky Blue Grass Turf Blend that is ideal for the Okanagan and Interior area of British Columbia. View our turf varieties here. In the Okanagan we service the following cities near Penticton: Kaleden, Oliver, Keremeos, Summerland, Hedley and Osoyoos. All you need is your square footage and we will convert your area size to how many rolls of sod you require. Your local turf farm supplier in Penticton and the Okanagan. Nursery sod rolls sold fresh from the farm to the Okanagan/Interior region. We also sell top soil ideal for new lawns. 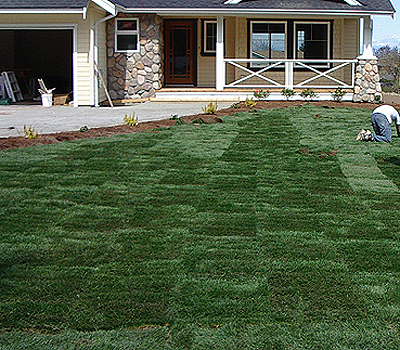 BC Instant Lawns has been a farm supplier of sod / turf products to Penticton and the Okanagan / Interior for over 20 years. We have installed sport fields, residential lawns, and golf course fairways. We supply and deliver sod / turf grass rolls fresh directly from the farm to your home in Penticton, Osoyoos, Keremeos, Oliver, Hedley, Kaleden and Summerland . Ask about our Okanagan Blend type sod roll, specifically grown for the Okanagan area. Get a quote and purchase online for delivery.